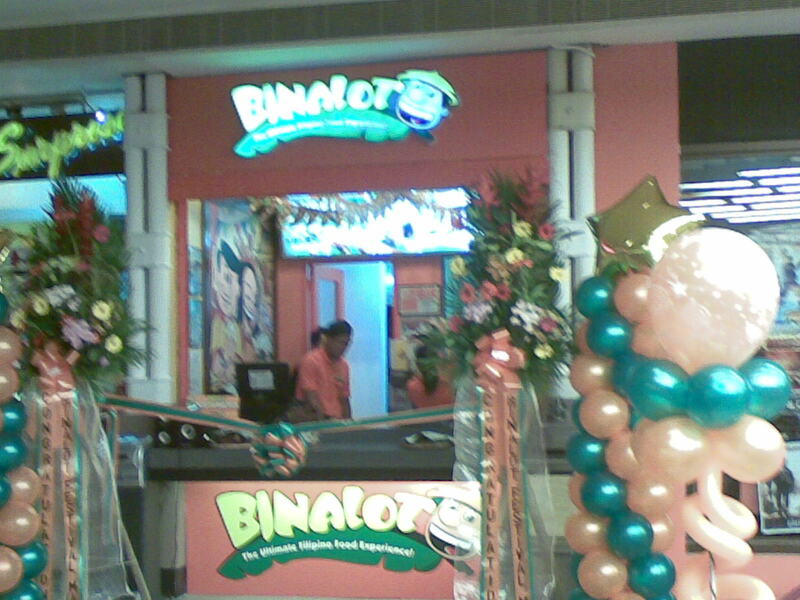 Binalot opened its 40th branch last May 30 at Festival Mall in Alabang. It is the latest of the Binalot franchise branch to hit the metro, 5 of the 40 are company-owned branches according to Binalot President, Mr Rommel Juan. 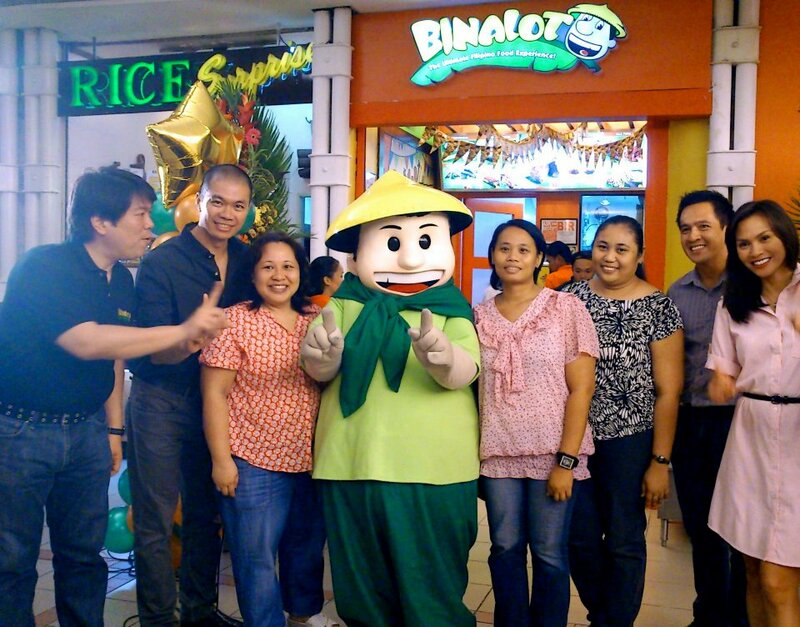 A ribbon cutting ceremony with Mr. Juan and the Binalot franchisee commenced the opening ceremony and store blessing. Mang Bina, the Binalot mascot was also there to amuse everyone. 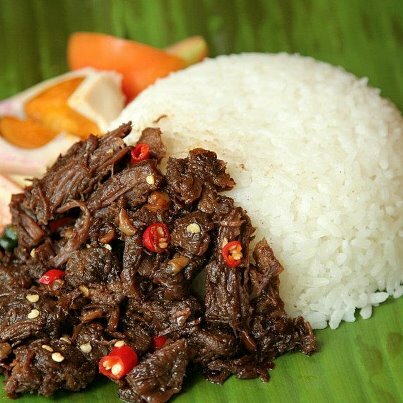 Binalot Fiesta Foods is a Filipino restaurant owned company that inspired the rediscovery of serving Filipino home-grown foods on banana leaves. The use of banana leaves is a welcome substitute to non-biodegradable styro boxes and plastics as people are now opting for green lifestyles and with raised consciousness about leaving minimal carbon footprints as possible. From a humble stall in Shaw Boulevard, Binalot with its "Adobo Pride" now competes with foreign fastfood businesses serving the best of the Pinoy classics – adobo, bistek, tapa, tocino, sisig, longganisa, daing na bangus plus the salted egg with tomatoes. It has grown to a 40-store strong major franchise player competing with the other fastfood icons. Binalot's “All-Time Pinoy-Vorites” main menu gives Filipino consumers smart, affordable meals and best value for money. And for every Binalot meal you purchase, the organization gives part of its earning to help local communities of Nagcarlan, Laguna and Aetas of Zambales. The use of banana leaves gives sustainable income to the local communities from which the leaves come from (that supplies all Binalot branches). So let us support BINALOT's advocacy as "Ang Pambansang Tsibugan” and go for Filipino foods we have come to love all these years!